Q. You're a veteran of research expeditions all over the world. What particularly struck you about the Galápagos? A. Two things. The first is the tameness of the animals. I've never been anyplace like that, on land or underwater. The animals don't seem to have any fear of you. You're walking down a path and you're within touching distance of all of them. It's the same way underwater. You've got these big pelagic fish and other animals so close you can reach out and touch them. It's a different kind of experience. Second, I'd have to say the sheer number of species that don't occur anywhere else in the world. You're constantly confronted with that when you visit the Galápagos. Smithsonian keeps asking if I'd like to lead a different tour, and I say "Nope!" I like going back. Every time I go I see different things, whether it’s the behavior of the animals or the actual wildlife that we're seeing. There’s still so much for me to learn. Q. Is there a Galápagos island that stands out as your favorite? A. It may seem funny for a marine biologist, but I'd say Genovesa, which is also called Tower Island and nicknamed "Bird Island." It's one of the islands which very few tour groups get to go to. I don't think even people who are bird watchers have ever had the experience of being with so many birds as you see on Genovesa. It's an incredible experience. Q. 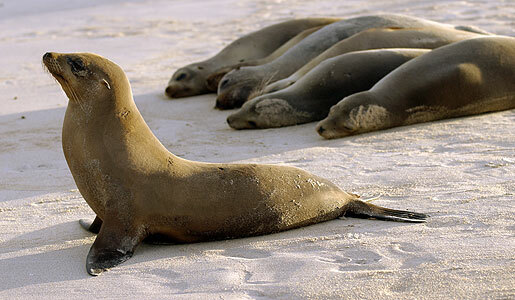 What do you particularly enjoy about the Smithsonian Journeys Galápagos itinerary? A. Several people who have been on the trip that I lead, who have traveled quite a bit, have said "This is the best trip that I've ever been on." People who have done an African safari often compare the Galápagos experience to that. One time on the plane leaving the Galápagos I sat with a couple who had been on a very unpleasant trip with another organization. They did one hike in the morning and that was it -- they didn't do anything the rest of the day. They didn't have anybody on board to give lectures; they didn't go snorkeling. The Smithsonian journey really packs everything in. People have the option of deciding whether to do everything or not, but to get as much of the experience as you can, this is the best! I want to emphasize how wonderful the snorkeling is. Some people go snorkeling for the first time, and they're in the water with sea lions and penguins and sea turtles and thousands of fish. When they get out they ask me "Where can we go next to have another experience like this?" and I say "Nowhere!" Q. What is it like being with Smithsonian Journeys travelers? A. The travelers are there to learn. It's not just a vacation for them; it's a vacation in which they’re trying to learn about the natural world. Along with schoolchildren, they are the most eager, enthusiastic people I deal with. Every group I go with seems like the best one I ever had! Q. What future Galápagos research do you have planned? A. I'm definitely hoping to submit a proposal to try and get the submersible back to Galápagos. When we were making the film, we used the sub for fifteen days and found seventeen new species. We need to have the sub back there and just take it in the water for a month, and then take it to some of the neighboring oceanic islands. We're still finding new discoveries in the shallow water as well, which is a little less expected, since people have been studying the shallow water and terrestrial flora and flora of Galápagos for a long, long time. When you find something that hasn't been reported before, there's always the chance that it represents a new recruit to the islands. People tend to think of the Galápagos as a place that was colonized a long time ago -- and it was -- but for the ocean animals there are currents that bring new things there. You could study that place forever. Want to see Galápagos for yourself? Click here for all Smithsonian Journeys travel to Galápagos and here for Carole's tour. Have you ever been snorkeling? What did you see? Share below. Dr. Carole Baldwin, a Curator of Fishes at the Smithsonian Institutions National Museum of Natural History, is a well-respected authority on marine biology, especially tropical marine and deep sea fishes. Her work has been published in many scientific journals and includes the discoveries of new species of fish in Belize, Tobago, Australia, Cook Islands, and the Galapagos Islands.